A great deal of time, planning and design work is attributed towards developing high-performance equipment for critical applications. The sealing experts at Precision Polymer Engineering (PPE) are often called upon to provide the ‘final’ component – the O-rings and seals – to complete the system. In many cases, design engineers do not consider seals early enough in the design process, with insufficient time allocated to consider a suitable sealing solution. When building or overhauling equipment, the bill of materials will typically list all the required components in order of perceived value based on cost and lead time. However, if this list was reordered by the criticality of each component you’ll find that sealing components rank much higher. In relation to the rest of the design specification, sealing components tend to be smaller in size and low cost and as a result can be often overlooked as trivial – placing them towards the lower priority end by default. More often than not, sealing components are grouped with nuts, bolts and other consumables – but with the critical nature of a seal, can you risk leaving your sealing solution to a mere ‘afterthought’? Elastomer O-rings are an important component within the whole system; without them the system will simply not function correctly. Seals are typically the weakest link within equipment, and getting your seal selection wrong can have huge implications for both safety and cost. When designing or maintaining equipment, engineers are looking to achieve maximum efficiency and long-term reliability. Both of these factors are fundamentally dependent on the performance of the O-rings. 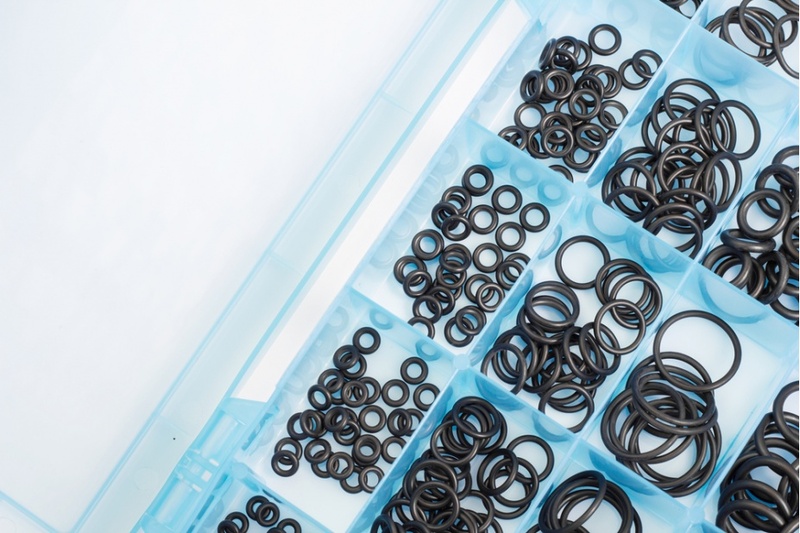 There are numerous reasons why O-rings fail, but correct elastomer material selection is the most significant consideration, followed by correct O-ring sizing and hardware design. Material selection – selecting the most suitable elastomer material for your equipment will depend on the operating conditions. Different elastomer types provide varying degrees of chemical resistance and low/high temperature capability. When you consider the number of individual material grades available within each material type, the choice is mind-blowing. Additional material properties such as compression set, hardness and co-efficient of thermal expansion can have huge implications in some applications. O-ring sizing – selecting an O-ring which is appropriate for the groove in which it operates will require an internal diameter that allows the correct amount of stretch for piston grooves. Similarly the correct cross section required to provide the right amount of squeeze for face seals. The optimum O-ring size for your application may be a custom size rather than an off-the-shelf standard O-ring. Hardware design – is the groove the right size? Does it allow for the correct amount of stretch and squeeze? Can the O-ring be energised by system pressure? Is there enough free space to avoid gland fill? Is the clearance gap too large which may necessitate anti-extrusion elements? Is an O-ring the best solution, or would a different profile be more appropriate? Should the O-ring fit the groove, or the groove designed to fit the O-ring? As one of the most versatile sealing components, O-rings are used across all kinds of industries for a diverse range of applications. The reliable performance of any sealing component is of crucial importance, but few are more critical or have more costly consequences than those used in the Oil & Gas industry. As evidenced in the high-profile case of BP’s oil spill in the Gulf of Mexico in 2010, the consequences of an oil leak can have devastating effects not only in terms of the safety of people, but the health of the wider environment. Along with the expense of the clean-up there is the irreparable damage sustained to a company’s reputation with such a detrimental PR disaster. All these factors combine to leave no room for compromise with sealing solutions in the oil and gas sector. In these high-cost, demanding applications where downtime is not an option, O-rings require careful consideration. The foremost of these considerations is whether any potential cost saving on compromised quality outweighs the risks associated with potential O-ring failure in the field. Problem: One of the world’s leading international oil and gas companies, operating nine platforms in the North Sea, was replacing 100 valves per day (approximately 2000 valves per platform) after experiencing a 200 litre oil leak. The source of the leak was found to be O-ring failure in a hose assembly, leading to concerns about the OEM bill of material and traceability. Findings: PPE carried out failure analysis testing and determined that; firstly, the failure was due to chemical attack; secondly, the O-ring was not in the material specified by the hose manufacturer; and thirdly, the specified material was not suitable for the operating conditions in any case. Solution: The OEM standardised on one elastomer material based upon compatibility data and industry approvals. PPE’s EnDura® V91A was specified for all valve applications in topside arrangements seeing -46°C (-51°F). Consistent performance in the field has now been achieved by using a single source, standardising on one material (capable of withstanding a broad range of applications), with full traceability and individual packaging to aid identification and eliminate the risk of incorrect selection during installation. There are a number of reasons why prioritising O-rings is beneficial. Firstly, it’s crucial to consider the cost of things going wrong in demanding, high stakes applications. It can take upwards of three weeks to strip a centrifugal compressor, with millions being lost in revenue, plus any associated equipment hire in the meantime. Taking the time to give due consideration to relatively inexpensive components can help to save huge amounts of money in reduced equipment downtime. Secondly, O-rings don’t belong in the same category as nuts and bolts. Components of this type are commonly standardised across different industries, with very few if any design considerations required from one industry or application to another. Although O-rings can be standardised for non-critical applications, improper design and material selection for the temperatures, pressures or process media involved in a critical application, can result in compromised efficiency and reliability from premature seal failure. Finally – should you discover, after laboratory testing or computer simulation that your intended O-ring selection is not going to perform as planned, how much time will you need to find an alternative solution? Following consultation with a seal manufacturer, a custom O-ring or other profile may be required and you will need to factor in design and manufacturing lead-times. 1. What are the application requirements? PPE offers an extensive range of elastomer material grades available to suit any requirements. Many material grades have been tested to industry standards such as NORSOK M710, NACE, ISO 23936-2, TOTAL and ISO 10423/API 6A. 2. What size does your O-ring need to be? Whether it’s a standard O-ring size or a custom size, your seal manufacturer should be able to offer you an infinite range of sizes, in a wide range of elastomer material grades. From the very small, right up to large diameter O-rings of 2.5m (8ft) outer diameter, and cross sections from 5mm (0.2”) to 20mm (0.79”); these large O-rings are often required to meet the needs of equipment such as valves and compressors. PPE offers large diameter, fully moulded O-rings that provide superior performance over jointed rings with advantages such as reduced risk failure, tighter cross-section tolerances and resistance to explosive decompression. 3. How might a custom sealing solution perform? Professional advice and consultancy service tailored to the unique demands of your specific sealing challenge, identifying the optimal elastomer material, size and physical properties of your required O-ring. Following consultation, a custom sized O-ring or alternative sealing component can be designed based on elastomer material properties and groove size/configuration. If the equipment itself is in design stage, PPE can provide hardware recommendations to maximise seal performance and reliability. Elastomer O-ring materials are laboratory tested and evaluated to provide the most complete picture of how they will perform in your application. PPE’s fully equipped polymer laboratory can undertake various testing including; chemical compatibility, failure analysis and thermo-mechanical evaluation. Computer simulation techniques can be used to model and evaluate the behaviour of O-ring seals under a variety of conditions that represent real-life applications. FEA analysis predicts the performance of the seal in a virtual environment, including contact forces, deformation and stress/strain levels. To prevent O-ring failure, ensure that your O-ring has been designed and manufactured to the exacting demands of your application from the first instance. For Oil & Gas industries, PPE offers custom, precision-engineered O-rings to exceed all expectations in terms of performance against critical temperatures, pressures and chemical media. When there is no room for error, use our comprehensive consultancy service complete with FEA analysis to guarantee optimum performance from your O-ring seals. Use our contact form or find your nearest sales contact to ask any questions about our services and performance elastomers.